This paper studies wind power development within electricity markets with a significant carbon price as the sole incentive. Simulation of electricity market and investment decisions by System Dynamics modelling is used to trace the evolution of the electricity generation mix over a 20-year period from an initially thermal system. A range of carbon prices is tested to determine the value above which market-driven development of wind power becomes economically possible. This requires not only economic competitiveness in terms of cost-price, but also profitability versus traditional fossil-fuel technologies. Results stress that wind power is profitable for investors only if the carbon price is significantly higher than the price required for making wind power MWh's cost-price competitive on the basis of levelized costs. In this context, the market-driven development of wind power seems only possible if there is a strong commitment to climate policy, reflected in a stable and high carbon price. Moreover, market-driven development of wind power becomes more challenging if nuclear is part of investment options. Keywords: Electricity market, Renewables, Investment, Carbon price, System dynamics modelling. The National Electricity Market was established in 1998 as a response to the overall liberalization and restructuring of the Australian electricity sector. The wholesale market integration effects of this establishment, however, remain to be systematically examined. We use econometric techniques based on pairwise unit root tests, cointegration analysis and a time varying coefficient model to study the extent of market integration in the physically interconnected regional markets based on daily electricity spot prices. The results from the pairwise unit root tests provide mixed evidence of price convergence while cointegration analysis does not reject the absence of persistent price differences across the physically interconnected regions. The results from the time-varying filtered coefficient model suggest that full market integration has not been achieved yet. We empirically show the presence of significant network losses and constraints across the interregional interconnectors in the NEM. 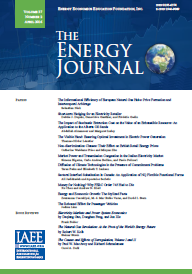 Our findings suggest that convergence in generation and network ownership, coupled with harmonisation of network regulation and regulatory institutional framework, will be increasingly important factors in improving wholesale market integration across all energy-only markets as they experience an increase in the share of renewable energy. Canada is one of the top energy users and CO2 emitters among the OECD countries. However, energy intensity has been declining, on average, by about 1.4 percent since 1980. In this paper, we use the Fisher Ideal Index to determine the contribution of changes in the composition of economic activities and efficiency to a decline in energy intensity in Canada at national, provincial, and industry levels. We also apply panel data estimation methods to further investigate the factors driving energy intensity, efficiency and activity indexes for the period 1981-2008. We test for endogeneity as well as cross-section dependency in the provincial data and control for factors such as climate, policy, and energy endowment. The national and provincial decomposition results suggest that most of the reduction in energy intensity has occurred mainly due to improvements in energy efficiency rather than shifts in economic activities. Within the industry, while energy intensity has declined significantly in manufacturing, it has remained stable in transportation, utilities, and construction, and increased significantly in oil extraction and mining industries. The provincial panel regression results indicate that energy intensity is higher in provinces with higher average incomes, faster population growth, colder climate, and a higher capital-labour ratio, and lower in provinces with higher energy prices and higher investment. The industry panel regression results show that investment has contributed to energy efficiency in utilities and mining and to a shift away from energy-intensive activities in manufacturing and transportation industries. Technological advances have been most effective in increasing energy efficiency in construction and utilities and in decreasing energy-intensive activities in manufacturing industries. The results indicate that although efficiency contributes to a reduction in energy intensity in Canada, increasing activity in energy-intensive industries, such as oil and mining, partially offsets the efficiency gains in other industries.